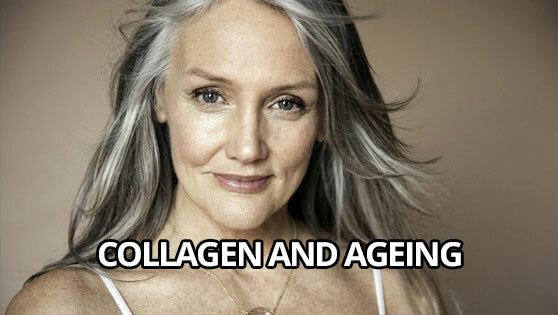 Let’s face it, nobody likes the effects of aging and how our bodies change or begin to hurt. We yearn for the day that we were able to hop up and play all day, not worrying about hurting the next day. There are many factors involved as we age, one of them is collagen derogation and decreased production. Found in every part of our body, collagen makes up over 25% of all the proteins naturally found in the body. There are many different forms tailored to what it’s task is. It makes things not only flexible, but strong and supported. It is the “glue” that literally holds us together. As early as 25, the production of collagen begins to decrease at about 1.5% a year. That doesn’t sound too bad, but this decrease is cumulative. By the age of 40, collagen production is down 22.5%. In addition, the collagen fibers that are already in our body have begun to fail us and not replaced quickly enough because production is down. This is what causes some of the signs of ageing. On the inside, decreased collagen can affect our joints, making things like arthritis worse and make muscle recovery take longer. Aging is natural, but you can put up a good fight. The first steps to keeping the collagen output at its highest levels possible, is to adapt a healthy lifestyle. Factors like smoking, sun damage and poor nutrition can only make things worse. There have been studies shown that collagen supplements have helped in reducing fine lines and wrinkles, while plumping up the skin to give it a thicker and fuller appearance. More collagen in the body can also make the hair look fuller by having more collagen cells to wrap around the hair shaft, physically making the strands of hair thicker. On the inside, supplemental collagen has helped with the reduction of aches and pains in the body. It can help reduce swelling and help stimulate cartilage growth where it has begun to wear down. Additionally, it can help any inflammation in joints and aid in muscle repair. Aging stinks. No one likes it, but there are things we can do to help slow it down and make us feel a bit younger. Diet, nutrition, and supplements are a good start to any regime of health and wellness. The sooner you stop, or never start, bad habits, the younger you will look and feel. We have looked into 40 different collagen-based products, starting with collagen creams and finishing with collagen drinks. Let us know what you think of those products!